Michael Cera is awkward. When we meet at a Swiss Chalet near his home in Brampton, Ont., he says hi three times in the first minute, shuffling in his seat. Within a few minutes, he settles in with a chocolate milk and begins chatting excitedly about George Michael Bluth, the character he plays on Arrested Development, the critically adored and perpetually beleaguered Fox sitcom, which airs on Global in Canada. Now in the midst of a make- or-break third season, the fate of the show is, as per usual, unclear. Low ratings prompted Fox to cut this season’s run from 22 to 13 episodes, and renewal looks unlikely, though the possibility of being rescued by U.S. cable channel Showtime has been floated. On the show, George Michael is a naive and earnest teen, often bewildered by his extended family — all of whom live together following the collapse of the family’s home-development empire. Cera plays the character flawlessly; his awkward mannerisms and palpable discomfort are triumphs of comedic timing, though perhaps not entirely an act. 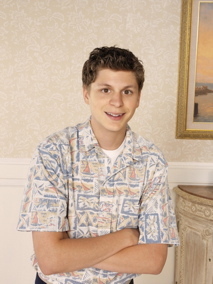 The real Cera is much cooler, of course; he wouldn’t be caught dead in the gaudy vintage shirts that George Michael wears, a relic of creator Mitchell Hurwitz’s childhood wardrobe (though Cera says they help his acting: “With the clothes I wear, it’s very easy to be self-conscious”). And while George Michael’s palms sweat when he talks to Maeby Funke, his cute female cousin, Cera holds his own on the Ron Howard-produced program that’s won six Emmys, including Outstanding Comedy Series in 2004. Cera started doing commercials when he was eight; his first role was an unpaid gig for Tim Horton’s Summer Camps, followed by a spot in a Pillsbury ad, among others. Shawkat, who plays Maeby; both nailed the roles, becoming the first two characters cast. Since joining Arrested Development, Cera has splurged once, buying a Martin Acoustic guitar for around $1,000. Most of his earnings — Cera doesn’t know how much (“It’s something in the thousands, nothing ridiculous”) — go into a state-regulated fund that he can access in April, when he turns 18. His family lives comfortably off his Sicilian father Luigi’s salary as a Xerox technician, a job he’s held for more than 20 years. Cera’s appreciation of Arrested Development is unabashed — he is effusive about the quality of writing and hopes “they don’t dumb it down to try to grab a few more viewers” — but he’s already taking the long view of his career.